So we had an informal review last Friday of our work we've been doing so far. It was all of our mentors and us. It went pretty good, and they gave us pretty good feedback for our next formal review on december 14th, that one is the one to worry about! So besides all that I've been doing at disney, I got an interview at the character design blog! This is one of the samples that I did for the Toy Story Illustrated book. Painted with gouche, and is about 3" x 5" I really can't wait to start on this project I'm soooo excited! I will start on mid January, 'til May. 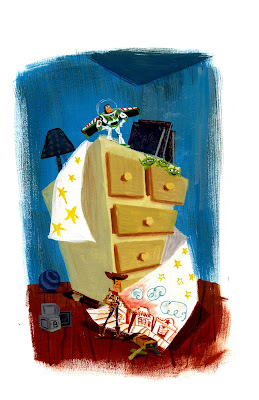 So recently I did a few samples for the Disney publishng company, for a Toy Story illustrated book, and they got aproved!! (I'll see if they can be posted) So starting on January I'll be illustrating the book, I'm really excited!!! Meanwhile I keep working on my side project for my cookbook. 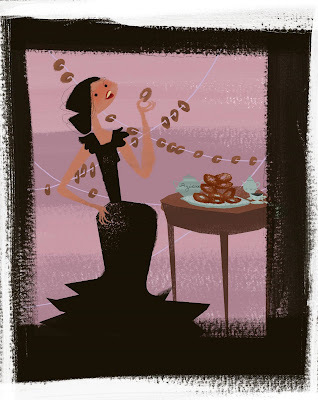 This is a recepie for roscos de anis, they are licorice like flavored pastries, they are very delicious!